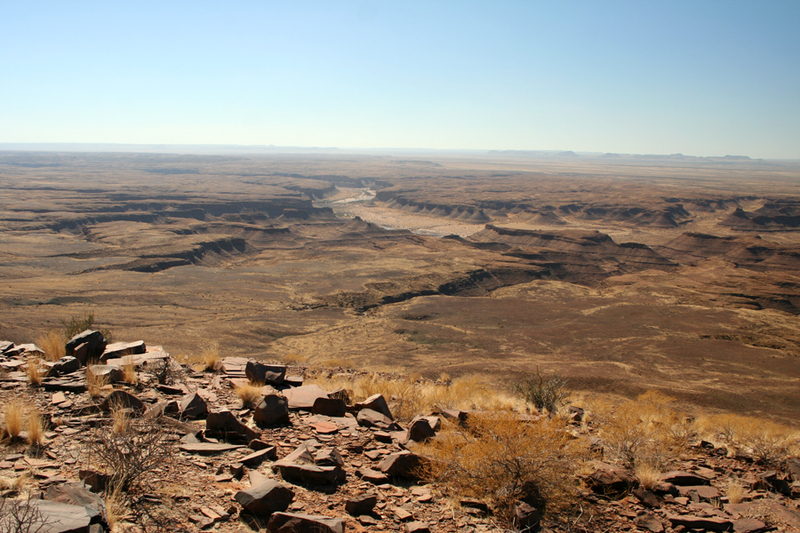 Fish River Canyon"... Danke für die perfekte Ausarbeitung und Organisation unserer mit vielen Aktivitäten geschmückten Reise in den Süden Namibias und in den Kgagaladi Transfrontier Park. Es war alles Bestens und wir werden so eine ähnliche Reise garantiert noch mal machen. Wir werden allen von Namibia vorschwärmen und gerne Namibian Life Travel weiterempfehlen. ..."
"... Wir sind gestern gut und wohlbehalten kurz vor Mitternacht in Wien angekommen. Alles bestens - wenn es auch etwas unwirklich ist, wieder in Wien zu sein. Heute haben wir einen kleinen Stadtspaziergang gemacht; der Kontrast war schon bemerkenswert! Euch aber, und vor allem Dir, Ernst, sind wir sehr, sehr dankbar dafür, dass Du uns eine Woche lang Eure neue Heimat gezeigt hast - es waren viele neue, sehr unterschiedliche Eindrücke und Erfahrungen und für uns sicher die beste Einführung, die wir in Namibia haben konnten. Danke Dir dafür und für Deine Geduld mit Deinen nicht immer ganz einfachen Gästen! Jedenfalls: alles ist bestens, wir sind froh über das Erlebnis Namibia ..."
"... Eine perfekt organisierte und durchgeführte Reise im südlichen Afrika. Teil 1 war ein Besuch in einem privaten Tierreservat nahe Johanneburg, wo uns unser Guide Dorfmar ausgezeichnet betreute. Danach der 2. Teil an der Garden Route. Dort wurden wir bis Kapstadt von Gerd gefahren und geführt. Alle bei dieser Reise bewohnten Unterkünfte waren TOP und die Erlebnisse werden wir sicherlich nicht vergessen. Eingroßer Dank an Ernst Wallner von Namibian Life Travel, der dies alles für uns „Big Five“ möglich gemacht hat. ..."
Familie Jesch"... Wir bedanken und bei Ernst und Elisabeth Wallner von Namibian Life Travel in Windhoek für die professionelle und zuverlässliche Abwicklung unserer ERSTEN Namibia Reise. Ob Selbfahrer mit einem perfekt gewarteten Mietwagen, ob Fly In Safari mit Silvia Blaurock zu den Himbas, das alles war PERFEKT. Dazu kam noch, dass wir uns kurz vor der Reise entschlossen während dieser in Namibia zu heiraten. 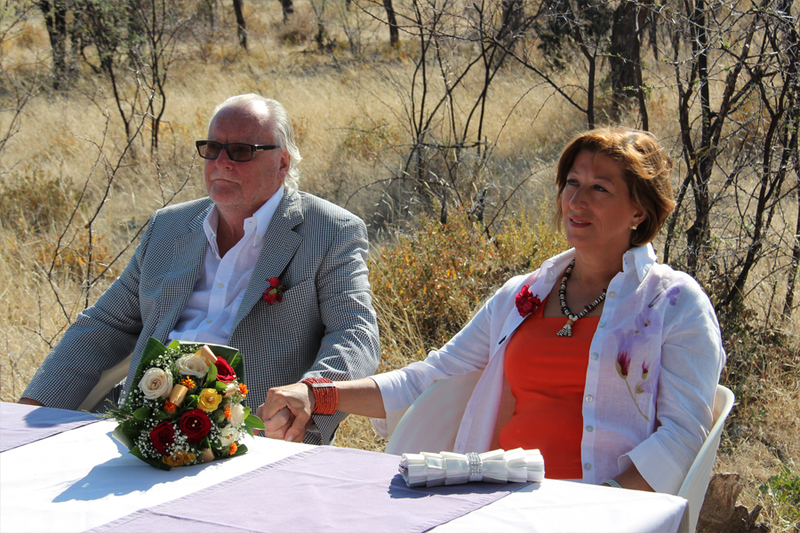 Obwohl die Zeit sehr kurz war, stellte Ernst alles auf die Beine und das Hochzeitsfest fand am 13.06.2012 auf Onguma Game Reserve im BUSH statt. Gerne werden wir Namibian Life Travel in meinem Bekanntenkreis weiterempfehlen ..."
"... Wir sind gerade aus Namibia zurück und möchten uns bei Ernst Wallner von Namibian Life Travel bedanken. Beginnend mit der Zusammenstellung der Route und der Unterlagen bis hin zur Betreuung vor Ort (persönliche Abholung vom/zum Flughafen, Transfer von/bis zum Hotel, Übernahme/Rückgabe des Mietautos inkl. ausführlicher Stadtrundfahrt durch Windhuk durch Ernst Wallner) hat alles – noch viel besser als erwartet – geklappt. ..."
"... Flug nach Namibia ohne Vorreservierung von Unterkünften getätigt. Gott sei Dank gab es Ernst von Namibian Live Travel, der in 24 Stunden das Unmögliche doch für uns arrangieren konnte. Über 3 Wochen das südliche, nördliche Namibia und dann noch ein Abstecher nach Botswana an den Okavango, war sicher kein leichtes Spiel diese notwendigen Unterkünfte auf dieser Route zu finden und auch trotz „High Season“ zu bekommen. Besten Dank für das schnelle reagieren und die Durchführung. ..."
"... Unsere Reise hat uns sehr gut gefallen. Sie haben die Etappen ideal ausgewählt, und die vorgesehenen Pausen waren für uns dringend notwendig. Wir waren mit allen Unterkünften hoch zufrieden und es gab unzähliche beeindruckende Erlebnisse – z.B in Etosha: Wasserloch in Okaukuejo sahen wir Elefanten, Zebras, Giraffen, ein Nashorn und auf unseren täglichen Pirschfahrten fast alle anderen Tiere (außer Leopard) aber Löwen in Rudeln, ebenso Elefanten, es war unglaublich. Ich möchte mich nochmals im Namen meiner Freundesgruppe bei Ihnen für Ihre Reisezusammenstellung bedanken! Gerne werde ich Namibian Live Travel in meinem Bekanntenkreis weiterempfehlen. ..."
"... Wir bedanken uns bei unserem Mitglied Ernst Wallner von Namibian Life Travel, der unsere heurige ÖNG-Studienreise professionell gestaltet und vorzüglich organisert hat. ..."
Staying in a tent or cave with an en-suite bathroom, getting up close and personal with the wild animals — you can expect the unexpected when you go on a luxury safari in southern Africa. Wolwedans Dune Camp/Lodge: This desert area features stark scenery — golden grass savannah, purple mountain ranges, spectacularly clear star-gazing, and creatures small and large, from white dancing spider to oryx. Little Kulala: Here in the Namib Desert each beautifully curved red sand dune invites you to climb up its sharply defined ridge where sunlight meets shadow. San Camp: A meerkat might climb on to your lap, to gain some height for that famous lookaround pose as you sit on the ground near their burrows. Then you meet the Bushmen, who chatter away happily in their click language as they introduce you to their traditional way of life. Vumbura Plains: Lions, leopards, giraffes, hippos, warthogs, kudu, painted dogs, baboons — all the animals roam free. You see them during the day, you hear them at night. Elephant Camp: "Walking with Sylvester" literally means walking with and patting a three-year-old cheetah, who has been raised as an orphan. With your face inches away from his head, you feel privileged to be allowed to be so close to him. Somalisa: You walk out of your luxury tented camp — and look directly into an elephant's eyes, barely a metre away. Is this when you are supposed to blow the emergency airhorn? Well, no. This is just another one of those amazing, unexpected on-safari moments. Amalinda: Hike half an hour up to a cave in the Matapos area to see wellpreserved and amazingly realistic rock art. Amalinda also supports several local community initiatives you can visit, including an orphanage and a school. Of course, the true test of a well-planned trip — especially to a remote area — is what happens when something goes wrong. insurance, filled out the predeparture health form — then the travel agent and camps should be able to react immediately," says Monika Korn of The Safari Source. Notified of my chipped tooth and cracked eyeglass lens when we were staying at Little Kulala camp, Korn contacted fellow travel agent Ernst Wallner, of Namibian Life Travel, in Windhoek, Namibia's capital, where we had a brief stopover the next day. Little Kulala invoked its medical emergency insurance to make sure the bush plane picked us up first thing in the morning rather than at the scheduled afternoon time. So when Wallner met us at the Windhoek airport, he had already made appointments for me to see a dentist and optometrist. "It's so important to deal with an agent who has on-the-ground experience, resources and local contacts, and who has chosen camps that really take care of their guests," Korn said. At Vumbura Plains, where we realized we'd left behind a camera charger, concession manager Roger Carloni arranged for a replacement to be flown out on the next day's bush plane — without cost to us. An elderly couple (80, 73) driving a rental car on their own five weeks and 5,600 km across Namibia, from the Orange River in the south to the Kuene River in the north, from the Atlantic Coast to the Kalahari/Etoscha. The whole trip planned and organized for us by Namibian Life Travel - and we didn't have a single glitch, not even a flat tyre! Better it could not have been! But what we liked the most about Namibian Life Travel was the fact that they tailored the trip to our particular interests and wishes. It wasn't just another safari off the tourist assembly line, but a very personal, and therefore very fascinating trip for us. Thanks to Namibian Life Travel we were able to "do it our way." All the internal flights (Botswana/Namibia) were met and on time. Planes were all of a good standard and the pilots friendly making sure we ended up in the right place. We were met by Elizabeth from Namibian Life Travel in Windhoek and she took us in her own car to the hire depot where she made sure our car was correctly sorted. We were given sufficient maps and details of our itinerary and shown the way out of the city. An excellent destination where Anju made use of the Wellness Centre and I went on a game drive. Both these activities were of a very good quality, as was the room and food. We were able to get a packed lunch to take with us the next morning. We followed the route suggested by Ernst - He is very good at doing this, though the translation from German to English was, sometimes, amusing. We were pleased to have the park permit as it saved us time at the park gate. We arrived in time to take a trip to the dunes supplied by the Lodge. The driver was brilliant, though the rest of the staff were not helpful at all. Room was good, but food ordinary. We had ordered packed lunches for the following day, one standard and one vegetarian. However, the veg lunch included chicken and other items we specifically stated we could not eat. Also, they had forgotten to charge us for the dune drive even though I had asked if there were any outstanding debts and remembered as we were preparing to leave demanding payment in a public place in front of other guests. The only reason for staying there is the access to the dunes, so perhaps the manager feels they do not have to make much of an effort to be polite, or efficient. We made use of our 4X4 the next morning going back to the dunes - great fun! It would have been better to have had longer here as we did not have enough time to do any of the walks. But there is always another time. Comfortable rooms, though small, and food excellent. An interesting and rewarding drive to the town. The Hansa is like stepping through a timewharp, though in a good way. It is a very well run establishment with excellent service and rooms. The restaurant was the best place we ate in during the whole trip - though rather expensive. We made use of the private parking, which was most convenient. The car was collected from the hotel, though the driver arrived early before we had got up. The assistant manager drove us to the airport and introduced us to Sylvia, our pilot. We thoroughly enjoyed our time in Namibia and intend to come back. When we do, we will ask for the same pilot as she really was the very best. The scenic flight over the dunes was great fun and we would recommend this to anyone. The welcome and the rooms were very good, as were the game drives. Our driver was very knowledgeable and keen to find as much to see as possible - including the Desert Elephants. Sylvia collected us and delivered us to Windhoek in plenty of time to catch our flight to Cape Town. Happy new year to you too and thanks for your greetings ! We had a good trip and Ernst was very helpful, both at our arrival and on our way back to Windhoek. Namibia is a beautiful country, we regret not to have taken more days to visit the desert ! !May be later this year. And the lodges booked were all very nice (except Etosha Safari Camp that I would not recommend !! But I understood that Ernst had not much choice in term of accommodation). Ongoma and Alternative Space were the best and we very much enjoyed our stay there. All my best wishes from a rainy an rather cold also Harare ! And thanks again for helping us preparing the trip. Ich bin vor kurzem nach einer dreiwöchigen Selbstfahrertour durch Namibia zurückgekommen und ich bin nicht nur von den Regionen, Tieren, Landschaften, die ich gesehen haben begeistert, sondern auch von der umsichtigen, verlässlichen, Sicherheit gebenden und sehr persönlichen Betreuung durch Ernst Wallner vom Namibian Life Travel. Mein Dank gilt auch seiner Gattin für die geduldige Begleitung durch Windhoek. Wenn ich wieder eine Reise ins südliche Afrika planen würde, würde ich mich unbedingt wieder an Ernst Wallner wenden. vielen Dank für die gute Organisation und den reibungslosen Ablauf unserer Tansaniareise. Es war wieder ein wunderschöner Urlaub für uns. Unser Fahrer bzw. Guide hatte gute Deutschkenntnisse, war sehr umsichtig und hat in jeder Lage auf uns Rücksicht genommen, wie z. B. Staub in der Serengeti. Als studierter Biologe gab er uns gute Einblicke in die Tier- und Pflanzenwelt Tansanias. Auf Sansibar hat der Flughafentransfer gut funktioniert. Unterkunft und Verpflegung können wir weiterempfehlen. Es waren alle um unser Wohl bemüht. Wir kamen am 27.1.2019 um 06:30 Uhr am Flughafen Addis Abbeba an. Unser Weiterflug nach Arusha-Kil.Airport war geplant um 10:15 Uhr. Tatsächlicher Start der Maschine 16:30 Uhr. Da das Flugzeug offenbar defekt war und wir dann mit einer Ersatzmaschine geflogen sind. Die tatsächliche Ankunft in Arusha war dann um 18:25 Uhr. Dazwischen warteten wir im Tranistbereich bzw. am Nachmittag 3 Stunden direkt im Flugzeug, wo wir dann um 15 Uhr warmes Essen bekamen. Dazwischen eingesperrt im Transitbereich ohne Möglichkeit auf Trinken und Essen. Um 11:30 Uhr wurden dann für jeden Fluggast 1/2 l Mineralwasser und ein Muffin ausgegeben. Dass wir dadurch einen halben Urlaubstag versäumt haben ist natürlich schade. Der Urlaub war einfach großartig, wir zehren sicher noch eine ganze Weile davon und wir verarbeiten die vielen Eindrücke immer noch. Die Route und die Unterkünfte hast du wieder einmal perfekt zusammen gestellt, nochmals herzlichen Dank dafür. „ Unsere Reise Victoria Falls – Namibia – Botswana vom 2.- 30. April 2018 wurde von Namibian Life Travel (Ernst und Elisabeth Wallner) von Windhoek aus, in Abstimmung mit uns, komplett organisiert. Der überwiegende Teil unserer Reise war eine „Selbstfahrer- Tour“ mit geländegängigen Pick-ups (Toyota Hilux) mit Dachzelt und Camping Ausrüstung. Nur der Besuch der Victoria Fälle wurde gleich am Beginn der Reise in den Flugplan integriert d.h. die Anreise erfolgte von Wien über Addis Abeba nach Victoria Falls (Zimbabwe) und in der Folge weiter nach Windhoek (Namibia). Dort wurden auch die Fahrzeuge übernommen und auch retourniert. Bereits in der Vorbereitung konnten wir die präzise Organisation erleben. Die persönliche Betreuung nach Ankunft in Windhoek mit detaillierter Einführung, einem bestens strukturiertem Programm und umfangreichen zusätzlichen Informationen und Tipps, waren die besten Voraussetzungen zu dem, wie sich in der Folge herausstellte, perfekten Ablauf der Reise. Die Fahrzeuge die über Vermittlung von NLT angemietet wurden waren neuwertig und dementsprechend in einem Top- Zustand (ein Kabelschaden beim Kühlschrank konnte durch sofortige Hilfe von NLT und der Verleihfirma kurzfristig lokal behoben werden). Im Zuge der Reise stellte sich die Notwendigkeit verlässlicher Partnerfirmen insbesondere bei Mietfahrzeugen heraus, da wir unterwegs immer wieder von Problemen andere Reisender hörten. Die Unterkünfte in Lodges oder Guesthouses waren durchwegs gut gewählt und in vielen Fällen hervorragend. Auch die Campingplätze waren immer in besten Lagen und sehr zufriedenstellend. Alle geplanten Arrangements und Exkursionen funktionierten nach Plan und ohne Probleme. Ein einziges Mal war das Tagesziel etwas zu ambitiös und der reservierte Campground daher nicht erreichbar. Hier reagierte NLT vorbildlich durch die sofortige Organisation einer Alternative (wobei unser mitgeführtes Satellitentelefon hilfreich war). Zusammengefasst kann ich feststellen, dass uns unsere von Namibian Life Travel perfekt organisierte Reise unvergessliche Eindrücke bescherte. Ein wesentlicher Faktor für den Erfolg war die Vertrautheit von Ernst und Elisabeth Wallner mit den Destinationen durch ihrer Präsenz in der Region. Also wer individuell, selbstfahrend und trotzdem "geführt" reisen will, der ist bei Namibian Life Travel, also bei Ernst und Elisabeth Wallner genau richtig. Wir traten im Februar 2018 eine 10 tägige Rundreise durch einen kleinen Teil Namibias an (unsere erste und sicher nicht letzte Namibiareise) Abholung und Mietwagenübernahme klappten schon mal bestens. Hintennach kam eine perfekt zusammengestellte Tour. Ernst dachte wirklich an alles. Optimale Streckenführung, tolle Unterkünfte. Das gut gewählte Programm endete mit der faszinierenden Tierwelt. Hautnah. Wir erlebten eine professionell und echt toll organisierte Kurzreise. Jede Station ein Highlight. Ernst ist ein echter Profi! Danke euch beiden nochmals für die persönliche und herzliche Betreuung - danke für alles! Wir hatten eine TOLLE Reise! Alles hat geklappt mit African Quest . Alle waren immer pünktlich, die Hotels waren unseren Ansprüchen genügend und sehr nett. Um die Abflugzeit aus Zanzibar, die um 2h verspätet war, hat sich auch der dortige Partner von African Quest gekümmert. Unser Safari-Guide, Oscar, war sehr nett und hat über alles etwas erzählen können, in einem guten Englisch! Es hätte einen Flug von Zanzibar direkt nach Addis Abeba gegeben mit der Ethiopian. Da hätten wir uns den Wahnsinn in Dar es Salam erspart. Wir haben Tansania alle sehr genossen!!! Post is very useful.Thank you this useful information. Alles hat geklappt mit African Quest . Alle waren immer pünktlich, die Hotels waren unseren Ansprüchen genügend und sehr nett. Um die Abflugzeit aus Zanzibar, die um 2h verspätet war, hat sich auch der dortige Partner von African Quest gekümmert. am Ankunftstag in Wien waren wir etwas erledigt und am Freitag war ich schon wieder im Geschäft und habe ganz vergessen zu schreiben. Der Urlaub war einfach großartig, wir zehren sicher noch eine ganze Weile davon und wir verarbeiten die vielen Eindrücke immer noch. Die Route und die Unterkünfte hast du wieder einmal perfekt zusammen gestellt, nochmals herzlichen Dank dafür. wir sind wieder gut in Deutschland angekommen. Die Reise war wirklich ein Traum, nochmal vielen Dank für deine tolle Organisation. Es hat alles wunderbar geklappt und wir haben uns dank der Beschreibungen auch sehr gut zu Recht gefunden. Die Hotels und Lodges waren wirklich alle gut und besonders das Kwafusebi Tented Safari Camp war eine sehr schöne Erfahrung. Alle Mitarbeiter und Ranger haben sich immer sehr viel Mühe gegeben und sogar das Camp im Krüger Park war obwohl es das Älteste war gut. Die Strecken und Routen waren optimal geplant und aufeinander abgestimmt und wir waren von den verschiedenen Vegetationen beeindruckt. Mit dem Auto hat auch alles sehr gut geklappt und war sehr komfortabel. Dieses Erlebnis als Selbstfahrer kann man wirklich nicht beschreiben und sind froh deinem Rat da gefolgt zu sein. Wir werden bestimmt nochmal auf dich zurück kommen, da wir in 2-3 Jahren nochmal so eine Reise planen möchten. Afrika hat uns jetzt in seinen Bann gezogen Außerdem haben wir schon viele Nachfragen von Freunden und Bekannten bekommen und empfehlen dich gerne weiter. Nachdem unsere Namibiareise nun schon wieder ein paar Tage vorbei ist, wollen wir Dir noch ein kurzes, persönliches Feedback geben. 1. Organisation war sehr gut und alles verlief eigentlich nach Plan. 2. Sehr positiv haben wir die Einführung, Besprechung und das Service am ersten Tag in Windhoek empfunden. 3. Am Anfang hatten wir eher “volles“ Programm, das eher wenig “Freizeit“ zuließ. An manchen Orten haben wir uns mehr Zeit gewünscht (z. B. Swakopmund). 4. Der “Umweg“ über Twyfelfontein hat sich hauptsächlich wegen der genialen Campsite gelohnt und nicht wegen der Felsgravuren. Vor allem wenn man vorher schon Felsmalereien gesehen hat. 5. Im Chobe NP würden wir das nächste Mal nur im Westteil bleiben. Beim Kasane Gate ist es zu touristisch und auch verhältnismäßig wenig Wildlife. 6. Die Entscheidung zu Gunsten des Zelts (und gegen Lodges) war im Nachhinein völlig richtig. 7. Sämtliche Campingplätze und B&Bs waren in Ordnung und die Auswahl sehr abwechslungsreich. 8. Die “Lower big 5 Tour“ bei Swakopmund ist perfekt und sollte niemand verpassen. 9. Die Aktion mit der vergessene Jacke und das nette Abschlussschreiben trugen natürlich auch zu unserem äußerst positiven Eindruck für diese Zeit bei. Alles in allem war es eine sehr schöne Zeit und wir haben schon diskutiert, wie wir die nächste Reise in dieser Gegend anlegen würden. Die Rundreise war super und Paul war ein wunderbarer Chauffeur und Reiseführer. Die Lodges waren sehr abwechslungsreich, alle von sehr guter Qualität. Die Route war auch sehr gut geplant und durchdacht, wir haben wirklich sehr viel gesehen - angenehm waren vor allem die Male, wo wir 2 Nächte in derselben Lodge verbracht haben - das tut gut, an einem Platz ein bisschen zu bleiben. Das Einzige, das uns gefehlt hat: es war insgesamt doch ein sehr dichtes Programm mit sehr langen Fahrten und mit unglaublich vielen Eindrücken und da wäre es angenehm gewesen, gegen Schluss einmal an einem schönen Platz zu bleiben und einen Tag "nur zu relaxen". Was sich dafür sehr gut angeboten hätte, war zum Beispiel das wunderschöne "Onguma Bush Camp" beim Etosha Nationalpark. Das ist ein Punkt, den wir bei einer nächsten Reise noch einbauen würden. Ansonsten sind wir voll des Lobes für den Planer Ernst und den Reiseleiter Paul! „Liebe monika, liebe Miriam, lieber Ernst, Wir sind heute wieder gesund daheim, es war ein traumhafter, einzigartiger Urlaub. Wir haben sehr viele tolle Eindrücke erleben dürfen, jeden Tag immer wieder ein Highlight , alles gesehen außer Geparden. Tolle Unterkünfte, sehr gutes Essen, keine Pannen. Also alles bestens. Bilder schicke ich noch zu. Vielen vielen Dank für Eure Bemühungen, es hat sich gelohnt. bereits zum zweiten Mal hast du für uns durch eine perfekt ausgearbeitete Selbstfahrertour zu einem unvergesslichen Reiseerlebnis beigetragen. Vielen Dank auch fürs Abholen und Bringen, für die Beantwortung unzähliger Emails und Fragen und für deine Verlässlichkeit. Wenn uns das Afrika-Reisefieber das nächste Mal überfällt, werden wir uns auf jeden Fall wieder an dich wenden. bereits zum zweiten Mal hast du uns eine Selbstfahrer- Afrika-Reise zusammengebastelt, genau nach unseren Wünschen und mit vielen individuellen Tipps. Wir sind auch diesmal wieder begeistert durch wundervolle Landschaften gereist und haben viele unvergessliche Eindrücke mit nach Hause genommen, diesmal von Victoria-Falls über Botswana und dann durch Namibia. Der Ernst hat uns die Tour organisiert, 3 Wochen ganz professionell geführt. Namibias Tierwelt ist grandios, die Pflanazenwelt einfach famos. Soweit der Blick auch reicht, keine Landschaft der anderen gleicht. Die Unterkünfte - von Ernst gebucht - waren alle eine Wucht! Das Essen und Trinken ein Gedicht, davon man noch lange spricht. Reinhold und Martha, Christl und Otto (Johannes) sagen einfach nur Danke für diese wunderschönen, perfekten 3 Wochen mit Ernst. First of all, my great thanks and special appreciation for making our second Namibian trip so enjoyable. Everything went along without a hitch, thanks to your great organizational talents. I'm sorry about the fuss with the car - I still don't know what was wrong but having driven it myself, I agreed completely with Lisl. I didn't want to set out on a 5,000 km. with a car like that: the clutch was loose and the brakes faulty. But the "substitute" Toyota was great and problem free - just like the one we drove in 2013, so thanks again. OK, to round up. We thoroughly enjoyed the trip, although in general we didn't find the landscape as beautiful in the north as it is in the south. Also, on our first trip everything was new and each stop was different - from the red dunes to Fish River Canyon, the Sossusvlei, Swakopmund and up to Etosha and Epupa. This time, the driving, particularly through the flat Caprivi, was a bit boring - but we wouldn't have missed it. So our thanks once again. My comments are not meant in any way as criticisms, but as a feed-back to help you plan other safaris in the same interesting and efficient way as you have ours. Vielen herzlichen Dank für die perfekte Organisation und die reizende Reiseleiterin Andrea Paasch. Sie war eine hervorragende Wissensvermittlerin und Unterstützung für uns. Wir kommen jederzeit gerne wieder auf dich zu, wenn wir uns in diese Ecke der Welt bewegen und empfehlen euch guten Gewissens weiter. Dir lieber Ernst sei ganz, ganz herzlich für die wunderbare Organisation der herrlichen Reise gedankt - es war wunderschön und hat alles geklappt ! Minianmerkung, bei der Anfahrtsbeschreibung der alten Kalkofenlodge ist ein kleiner Zahlendreher drin, denn die Lodge ist auf der D 462 und nicht auf der D 463. Aber das sind Marginalien und hat unserer Erholung keinerlei Abbruch getan ! Insbesondere die Camps in der Etosha betrafen bei Weitem unseren Erwartungen - vielen Dank dafür !! Besten Dank für die hervorragend ausgearbeitete Namibia Tour. Wir haben während der Vorbereitung und dann vor allem während unserem Namibia Aufenthalt den Service sehr geschätzt.Danke für die Überraschung, gleich bei unserer Ankunft. Wir können und werden dich gerne weiter empfehlen. Ende Juli – Anfang August haben wir eine dreiwochige Selbstfahrertour durch Namibia, organisiert von Ernst Wallner, Namibian Life Travel, gemacht. Wir sind voller Eindruecke zuerueckgekommen. Alles hat perfekt funktioniert. Alles war an unsere Wuensche angepasst. Die Sugestionen von Ernst und Elisabeth Wallner waren alle sehr nuetzlich. Das Programm war ausserordentlich reichhaltig, waehrend der Reise haben sich die Erlebnise gesteigert und dabei haben wir doch jeden Tag genug Zeit zum Relaxen. Wir haben viel von Namibien erwartet. Schliesslich haben wir uns monatelang bevor mit der Literatur ueber dieses schoene Land befasst. Doch, alle unsere Erwartungen wurden mehr als ueberschritten. Wir waren zu dritt (52, 19 und 16 J.) als Selbstfahrer in den Osterferien 2 Wochen in Namibia - super ! Nach unzähligen Mails und immer wieder neuen Angeboten von Ernst haben wir gebucht und die Reise genau so vorgenommen, wie sie uns angeboten wurde - super ! Jeder Tag war voll mit neuen Erfahrungen, es war sehr abwechslungsreich und wir haben uns immer wieder gefragt, wieso konnte Ernst wissen, dass wir jetzt genau dies oder jenes brauchten. Da merkt man, dass er das Land kennt und seine Kunden einschätzen kann - super ! Keine Strecke war zu lang geplant, kein Ausflug sein Geld nicht wert, alle Unterkünfte bestens, es gab wirklich nichts zu kritisieren. Und Ernst war immer im Hintergrund dabei und fragte auch nach, wenn er den Eindruck hatte, dass wir Unterstützung brauchten - super ! Wer 14 Tage Namibia zum ersten Mal besucht, dem würde ich die Reise genau so empfehlen, wie wir sie gemacht haben - super ! Ganz, ganz lieben Dank an Ernst, wir werden uns gerne noch lange die schönen Erinnerungen wieder ins Gedächtnis rufen. Wir hatten unsere Tour selbst geplant, Ernst erledigte die Buchung der Quartiere (ein besonderes 'Zuckerl' war im Okakuejo Camp, wo wir im Chalet direkt vor dem Wasserloch untergebracht waren, und die ganze Nacht staunend am Balkon verbrachten, um die vielen vielen Nashörner zu beobachten, die zum Trinken gekommen sind :)!) und die Reservierung des Wagens. Er holte uns frühmorgens vom Flughafen ab, brachte uns zur Autoverleihfirma und erkundigte sich auch während unserer Tour nach unserem Wohlbefinden. Am letzten Tag stellte sich seine liebe Frau als 'Shopping-Guide' zur Verfügung, im Anschluss daran gab's für uns noch eine Windhoek-Sightseeing-Tour und schließlich brachte Ernst uns wieder zum Flughafen. Möchte hiermit - wenn auch verspätet, dafür aber umso herzlicher - ein großes Dankeschön aussprechen! Sollte uns unser Urlaubsweg wieder einmal nach Afrika führen, wissen wir, an wen wir uns wenden werden! PS: Dass unsere Namibia-Reise ein wunderbares, eindrucksvolles, abwechslungsreiches und unvergessliches Erlebnis war, versteht sich von selbst. Namibia ist auch für Afrika-'Neulinge' bestens geeignet.